That’s right. This is totally a CHOCOLATE review. But not just any chocolate- an actual HEALTHIER chocolate you can feel good about eating! Attune Chocolate Probiotic Wellness Bars are exactly that- healthy, delicious, CHOCOLATE! 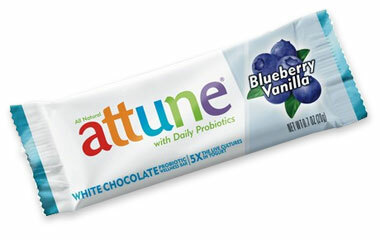 Attune’s bars may have approximately 6.1 billion CFU’s in each bar, but those probiotics don’t alter the taste at all! These are the same probiotics you find in yogurt that help keep the digestive system running smoothly. These bars are found in the refrigerated section of your grocery store to keep those probiotics alive & running. Each bar has 2 squares each, which are actually rather big (its a 20 gram bar). The bars also come in 7 flavors, chocolate crisp, mint chocolate, blueberry vanilla, dark chocolate, coffee bean dark chocolate, raspberry dark chocolate, and almond milk chocolate. I got to try the chocolate crisp, and blueberry vanilla varieties. Chocolate Crisp- ooh. This one reminds me of a Crunch bar. Smooth milk chocolate with little rice crisps embedded in each square. The smell of the bar is really delicious- just pure, smooth milk chocolate bliss. I wish they had a milk chocolate flavor without the crisps, as I prefer my chocolate plain, but it was still very good. Blueberry Vanilla- I really enjoyed this one! Just the SMELL of the bar was delicious- a true blueberry scent! I was a little hesistant to try this one at first-but glad I did! It was a sweet white chocolate with a nice addition of vanilla and blueberry flavors (and actual blueberry pieces!). This one was my favorite of the two. I wonder what it would taste like melted and drizzled on some icecream or with yogurt (too bad I already ate my bar!!). Overall, these get 4 stars. I love how Attune made chocolate a healthier indulgence, and didn’t blow calories or sugar content out of the park. I also like how they are a good source of calcium (and I got to skip my yogurt for the day without guilt knowing I ate some probiotics!). I found breaking off one square when a little sugar craving hit and letting it melt slowly in my mouth was just perfect. Chocolate Crisp- Milk Chocolate Coating (evaporated cane juice, chocolate, cocoa butter, inulin, non fat milk, calcium carbonate, Anhydrous Milk Fat, soy lecithin [an emulsifier], vanilla), Organic Brown Rice Crisps (organic brown rice flour, organic molasses, calcium carbonate), Probiotic Cultures (Lactobacillus acidophilus, Lactobacillus casei, Bifidobacterium lactis). Blueberry Vanilla- White Chocolate Coating (cocoa butter, evaporated cane juice, yogurt powder, lactose, inulin, nonfat milk, calcium carbonate, soy lecithin [an emulsifier], vanilla), Organic Brown Rice Crisps (organic brown rice flour, organic molasses, calcium carbonate), Freeze Dried Blueberry Pieces, Probiotic Cultures (Lactobacillus acidophilus, Lactobacillus casei, Bifidobacterium lactis), Natural Flavor.